Good luck to both Growler67 and Sturm Moonwolf for tonight's championship brawl. The two will face off to be the Fangs Champion Brawler! may the dice gods favor the bold. Also, sign up for Brawl Three starts today and ends on February 4th. Night 3, Brawl 3 starts next weekend!!!! First, I thiank my fellow wolf brethren for the congratulations. It is appreciated and I respectfully raise and ale tankard and toast you all. I bid a hearty challenge and respectful nod to my brawl opponent Sturm Moonwolf. May the RuneStones be cast and the Fates determined to whom the Honor is to be bestowed upon. For the Glory of the Fang and ALL the Wolf Brothers that come from within. My Wolf Guard shall step up to the challenge with ale dripping from his lips and the taste to deliver a rightful bludgeoning. All to be savored and later celebrated with fresh meat off the bone and ALE for ALL. Well I'll give it another try as a grey slayer. 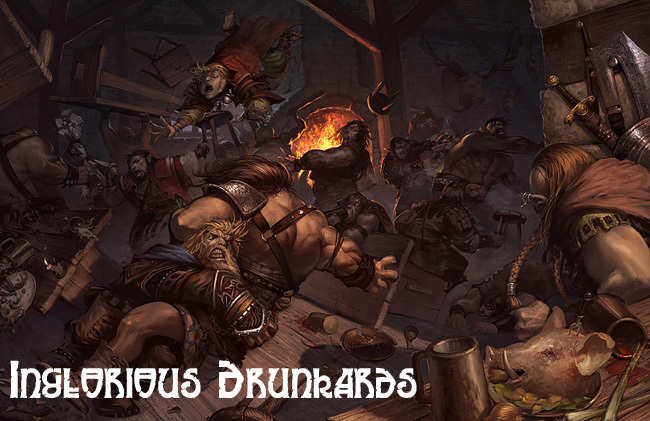 Ah, another evening of ale and brawling. May the runes guide me in delivering a good thrashing worthy of song! Third times the charm. Or fourth. Or fifth. Or ninety-second. One day, though, I shall crush you all and achieve victory! Bwah hah hah hah hah! Great Russ, I'm away for a short hiatus and look what has happened. Going to have to unleash Torvald and his power tankard in the next brawl! At the end of the day, we know who our true brothers are. We watch the halls of Russ, and remember our days of glory whilst persuing ever greater ones. We are the Sons of Russ, for the All-Father and the Wolf King. From now, until the End Days and the Wolftime. We play by our rules, and noone elses. welcome brother! it's always nice to see some greybeards now and again. I think wolf brother Beef was also interested. I will put you down for next weeks brawl. As for the championship. By saturday morning, the Fang will have it's first champion. May the runes guide the two warriors to glory! *Strokes big viking beard* Girl? What is girl? Hey OID, long time no see. Do you want to team up with my bloodclaw for the next round? May Lokyar guide my Fate. Heya Jonas, good to see you around! Sounds like a good plan. I'll be goin in as a scout, so lets find us a few more for the pack! Two inglorious brawlers face-off. Only one can be named champion. This brawl is being broadcast to the entire Space Wolves chapter, even those from the far reaches of the imperium. From the wolf blades of holy terra, to the wolves fighting in the eastern fringes. We have Ragnar Blackmane and his company placing bets amongst other wolf lords from other great companies. This is a main event people!!! we are live!!! our great wolf, Logan Grimnar will officially start off the brawl once he finishes his first drink from the sacred drinking horn of Russ himself. In one corner, we have wolf guard Sturm Moonwolf. Winner of the first tavern brawl. Accompanied by his pack brother Grey Mage as his corner man. Sturm Moonwolf, is a mighty long fang. Fighting out of the western islands of Fenris. This seasoned warrior fought tooth and nail at the first brawl. With the help of his fellow long fang, Grey Mage. Sturm Moonwolf earned the title of inglorious brawler. He is the first at B&C, here at the mighty Fang to be named inglorious brawler. His opponent is someone Sturm had fought during the first tavern brawl. Some of the veteran wolves see this inglorious brawler as the instigator, the trouble starter, the fire starter!!! Along side his pack brother Nacho Wolf; these two caused havok on the first brawl. It was they who kick started the brawl during that night, and from that night on... a rivalry was born! his name is Korvis, wolf scout. Any other details about the wolf scout remains a mystery. As warriors that are touched by Lokyar like to keep it. Korvis is seen accompanied by Nacho Wolf, who will be his corner man. Now, Korvis came in with a plan and vengence during the second tavern brawl. Facing off and eliminating teams quickly from the start. We were even honored by the presence of our lost kin the 13th. Those warriors fought well until the end. But it was Korvis and Nacho Wolf's determination that kept the two going that night until the end. HERE WE GO!!! Logan Grimnar just emptied the horn. May the rune stones favor the bold! and pray to the dice gods! Round One: both wolf guards hit each other twice. an elbow here, a punch there. headbutt, a knee to the chest. ouch you can here that echo, that was a mighty thump! Sturm Moonwolf wounds twice! no wounds from Korvis. Kovis makes his save! The two warriors go to their coners of the tavern. Each are given two minutes. Strategy are whispered from the long fangs corner. Grey Mage giving his pack brother tactical adivice. Korvis in his corner is seen eating a roasted boar, while Nacho Wolf is seen giving the long fang corner an ancient terran hand signal, using his middle finger. Round Two: the two warriors come crashing at one another, Sturm hitting Korvis three times. As Korvis returns with two. A mighty back hand here, a strong jab here. Korvis wounds Sturm twice, and Sturm kicks at Korvis in the kidneys, wounding him once. The two warriors make their save! It looks like Sturm has no problems adjusting to his new rank as wolf guard. Working well with the TDA armour. Unfortunately, it seems like Korvis is still adjusting with his new status as wolf guard.. I tell yah, going from scout armour to TDA is a major adjustment and we can see this from the attacks in the beginning! Round Three: Korvis lands a nice left hook. But Sturm was quick to turn it around with two attacks. Sturm wounds with one, Korvis doesn't inflict a wound. Korvis makes his save! I'm seeing it brotha! Korvis is not landing enough attacks in the begining. Its getting roudy in here! everyone is drinking and eating, Logan Grimnar is having a blast. This is going to go down on tavern history! Round Four: The two attack each other quickly, both hitting each other twice. Korvis manages to wound Sturm twice, while Sturm wounding Korvis once. The two make there saves! I think Korvis is getting the hang of the TDA, I think so brother! Round Five: Korvis hits 3, Sturm hits 3. Korvis wounding 2, Sturm wounding 3. Korvis makes 2 saves, fails 1. Sturm saves 1, fails 1. Lets see if the runic charms favor the bold. both make their save!!! that was close! Korvis is seem taking this seriously now from his corner. You see a grin on Sturm's face from his corner. Wait? is it me or did I just notice the ring girls? sisters of silence? Round Six: Korvis attack and lands two blows. Sturm is seen stunned, and lands only one. No wounds inflicted. Round Seven: Sturm comes in strong, hitting 3. Korvis hitting 2. Sturm wounding 1. Korvis wounding 1. Both make their save, and exchange a few words as they return to the corner. Lord Rags chatting it up with Grimnar. Also, it seems like the high priest Ulrik has entered the tavern... blessing both warriors, and drinking amongst the other wolf priest. Man that helm is creepy looking! Round Eight: The two warriors land 2 blows onto each other. Each wounding 1 each. Both make their save! we interupt this break... bartender found one belt of Russ, any one missing a belt of Russ please go to nearest servitor! I repeat, lost belt of Russ.. we all have one come on check your belts you drunkards!!! Round Nine: WOW.. Korvis charging in and landing everything. Sturm charging in, land only one! Sturm didn't expect that coming! Sturm wounds Korvis, and Korvis wounds Sturm three times. Both make their saves! this is going to be a long fight! yeah I think so! Round Ten: its an even match, both warriors landing three blows onto each other, now onto the wounds! Sturm wounds 2, Korvis 3. Korvis makes his 2 saves... Sturm saves 2, fails 1. no re-rolls as the charms were used up! The tavern is literally shaking! the halls of the fang erupt with cheers and shouting! GREY MAGE seen shaking his fist vowing revenge. Grimnar giving our winner a toast. Fresh drinks are serves and more food roasting over the fire pits. Ulrik seen giving our winner a pad on the back. So how can we end this championship brawl? Grimnar gives the sign! and EVERYBODY starts brawling... tis a good night indeed, a FUN night. FOR RUSS!!!!!! Sturm Moonwolf will face off against next weeks inglorious brawler. The winner of that fight, becomes the contender to face our current champion Growler67. Edited by MaveriK, 29 January 2011 - 01:01 PM. Hey, alright Growler! Way to lay some smack down! Hopefully I'll be seeing you in a couple weeks for the championship bout, but in the meantime, that's an awfully sweet WTN you will be equipped with. Use it well, and lay some pesky greater daemons low. You and I can probably handle the close combat so lets get Grey Mage and another Long Fang for fire support. Speaking of scouts, are you going to revive that epic tale you were writing? 1) Indicate your character's location and actions to a designated bartender/servitor. Post your instructions, it helps keep track of everyone on the trend and keeps everyone entertained at the same time. Lastly... PRAY to the dice gods! 2) Only five users may occupy one tile. Each character has the Independent special rule. 3) Users have an option to join a pack of up to a limit of 5 members. Your pack may team up with several other packs. The more the better! 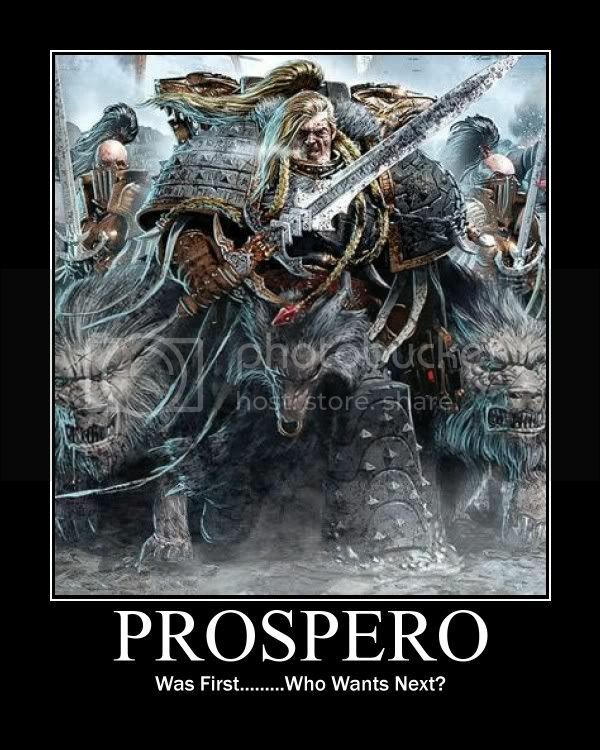 start a gang just in case other Astartes chapters decide to crash our party. Just remember, at the end of the night there can only be one man standing. Even if your team manages to be the victor of the night, the pack needs an alpha. Therefore to run your pack, you have to fight for the title. 4) Close combat weapons are temporary and are destroyed or left behind as your character moves onto the next tile. You can throw weapons, which counts as your shooting. 6) Previous winner moves up a league. League championship upgrades teams or characters to the following: Wolf Guard, Irong Priest, and Storm Claw. 7) The last man standing, wins the game and earns the title of Inglorious Brawler. 1) Wolf Pelt. +1 attack during counter attack. 1) Infiltrate+Move, Through Cover. Opponents who wish to target a wolf scout during the shooting phase must roll Ld to see if the wolf scout can attacked. During close combat, opponents who wish to get into combat with the wolf scout must roll Ld to see if you can strike at the skilled infiltrator. If opponent cannot strike at the wolf scout, the attacks are re-directed at the next opponent. 2) Scout+Behind, Enemy Lines. A Wolf Scout character, may choose to be placed anywhere in the map once everyone else has indicated their location to the bartender. 1) Fire Control. A character gains one additional attack during both shooting and close combat. Allowing the veteran wolf, to fight at two characters at once. 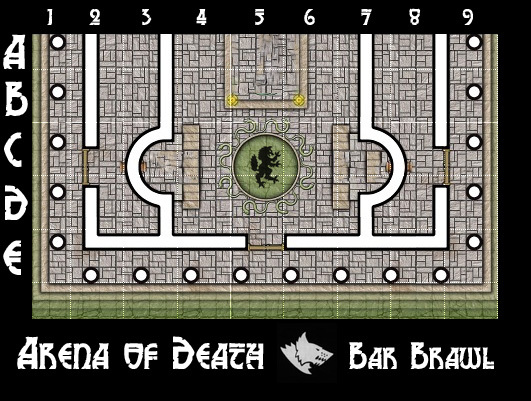 Imagine a pack of five Long Fangs occupying a tile! don't mess with the vets, show some respect! 2) Runic Charm. May re-roll one failed armour save per combat. 2) Bionics. May re-roll failed armour save per combat. 2) Healing Potions & Balms. Old tech, borrowed from the 13th company wolf priest. May ignore one failed armour save, may also help revive fallen team mate, per tile. Last day for sign up is on Friday February 4th. Edited by MaveriK, 03 February 2011 - 02:48 AM. I will have a tankard of ale and watch the tussle with amusement and I will raise a hearty toast to the victor when the dust finally settles. Then if you are lucky enough to get past Strum Moonwolf you may face me one-on-one in your attempt to best me for the Honor of the Fang as it's Champion Inglorious Brawler. And I see another rivalry cropping up, I doupt an old long fang like grey mage will let me get away with using sing language not to mention the fact that we have both knocked eachother out in the brawls. Edited by Nacho Wolf, 01 February 2011 - 02:01 AM. I'm in as, you guessed it, a Wolf Scout. Sorry, didn't indicate. Torvald is going in as a wolf scout, of course!